©Bert Gildart: The trail to Iceberg Lake accessed from the Many Glacier Valley in Glacier National Park is steep and winding and in places is flanked by timber that is dense. When the wind is blowing (as it was two days ago), voices are muted and apparently difficult to detect, even by an animal with a fairly good sense of hearing. 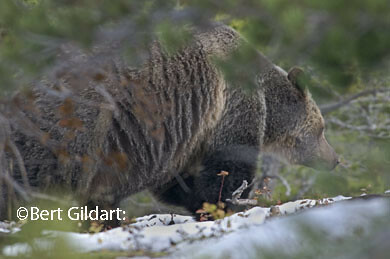 Fat as stuffed pigs, bears in Glacier's Many Glacier Valley appear ready to hibernate. Actually, we were searching for sheep and goats, but found a beautiful bear. By then, Art, Jack and I had all gotten the message, and we scurried to a knoll that was adjacent to the trail. Quickly we unholstered our bear spray, which all in our group of four were carrying, and stood ready for whatever fate might have in store. Simultaneously, Todd and I also set up our camera gear and it was then the grizzly bear appeared from the trees, still at about a distance of about 30 yard. We know that as we later paced off the distance. The bear was not in the least concerned about our presence, though it appeared as though he (we assumed because of its size) was simply looking for some last tidbits of food before entering hibernation. Perhaps some roots, as the berries were all gone. Certainly he was well fed, something you could see as you looked at the fat engulfing its neck. When it moved, you could literally see the rolls of fat that rippled in wave-like fashion down its entire body. And then there was his distended stomach, which almost touched the snow. The bear studied us for a few minutes, and then turned broadside. Slowly it began moving up the side of the steep hill. Where it was bound, we had no idea, but later in the day, we learned exactly where it was going. The bear was obviously about ready to hibernate, and from the various materials I’ve published on bears over the years know a little something about the incredible physiological process that is involved. Curiosity satisfied, the grizzly bear soon turned. In this part of the country bears begin to hibernate about the first of November. And the type of terrain they seek is precisely the area in which we were walking. Here in the Many Glacier area, where Janie and I were now camped in our Airstream and our photographer friends in their motorhome, it is the same area that sheep and goats occupy; and as we hiked, we counted dozens of each high above us in cliff faces. Here’s the terrain bears often seek when they are about ready to den up for their long winter sleep. Actually, bears are not true hibernators, for their body temperatures remain near normal, unlike that of the marmot, a true hibernator, whose body temperature almost drops to freezing. Breathing and heart rate, however, do slow and for about three months bears will exist without any food or water. Nor will bears defecate or urinate, and normally, this would mean a build up of nitrogenous wastes, which would poison the urinary system. 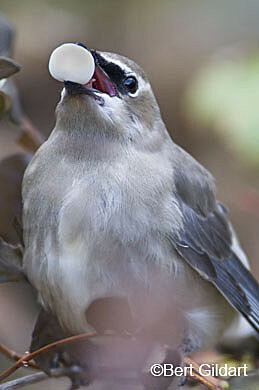 It's fall, and eveything seems bent on gorging itself, as did this Bohemian Waxwing. Bears solve that problem by diverting nitrogen from pathways that synthesize urea and toward those that generate amino acids and new proteins. And so life continues for three to four months, something we all marveled about throughout the day. After our bear departed into the unknown we continued hiking for about another hour, discussing at times the amazing ways in which animals have adapted to their environments. But the snows of several days ago became too deep, and we soon turned and began retracing our route, stopping at times to photograph other subjects. We found a Bohemian waxwing chowing down on snow berries. Periodically we also scoped the hills hoping to find sheep and goats close enough to the trail so that we could approach following a climb. Indeed the bear was moving our direction, but only because it was trying to put distance between us and needed to circle around a cliff, which he quickly did. And then we began studying the terrain, and we concluded that the area might be the precise area in which our bear would soon be settling in for a long winter sleep, for the mountain side had all the desirable features. Here was an area located up high and where snow accumulations would be deep. We glassed the area with binoculars and it seemed as though we could see an opening to what might have been a small cave. If so, this might be the bear’s denning chamber – its winter bedroom. But we’d never know about these specific, and decided it would be prudent to return to the trail and then head back to our campers. The goats had gone, spooked most likely by the bear which had headed in their direction. But what a day it had been for, and we all felt humbled to see this mightiest of all creatures that walks these majestic mountains. As an omnivore the animal is at the top of the biological pyramid. 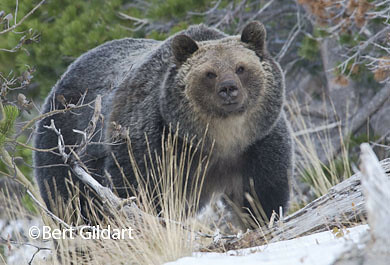 It’s huge, and In Glacier a large bear might weigh in at over 500 pounds. Because of its size and temperament, it fears nothing. Nevertheless, it has for the most part — perhaps at times with a little help from the Park Service — learned to respect man. That’s not always the case, but it is often enough so that people who elect to hike this beautiful valley can do so knowing their odds for peaceful co-existence are pretty darn good. If that’s your desire, this is a good time to camp in the Many Glacier Valley, where the bears are so fat it seems they can hardly walk, much less run. That, of course, is a fallacy! 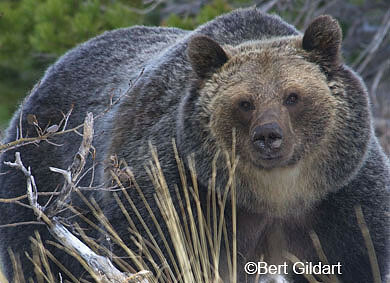 Stomach distended, this immense grizzly bear appears ready for little more than a long winter's nap. NOTE: Janie and I camped for four days with our photographer friends, returning just last night. We also saw moose, and our experiences with them was just as interesting as were those with this bear. Our next post will concern those experiences. 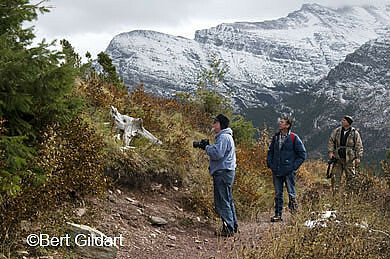 This entry was posted on Monday, October 19th, 2009 at 3:08 pm and is filed under Glacier National Park, Photography, RV Travel. You can follow any responses to this entry through the RSS 2.0 feed. You can leave a response, or trackback from your own site. Incredible pictures! Glacier N.P. quickly became one of my favorite places earlier this year. I really enjoy reading about your adventures in the park.